With mobile phone usage now reaching almost fifty per cent of the world’s population, there continues to be an urgent need to understand the impact and influence of mobile communication practices across the globe. Mobile Communication and Society: A Global Perspective examines contemporary mobile communication and the transformations which the incorporation of mobile phones in society. 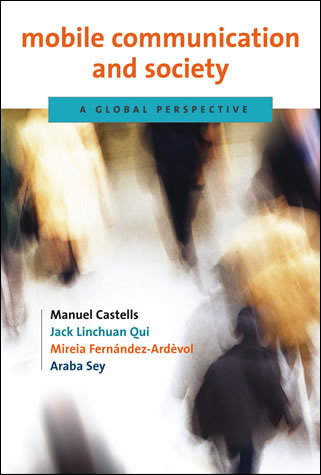 Co-authored by Manuel Castells, Mireira Fernández-Ardèvol, Jack Linchuan Qiu and Araba Sey as a project by the Annenberg School Research Network, the book synthesizes a range of qualitative and quantitative research on mobile phones in an effort to “construct an empirically grounded argument on the social logic embedded in wireless communication, and on the shaping of this logic by users and uses in various cultural and institutional contexts” (4). Framed within the rubric of Castells now famous notion of the “network society”, the authors divide the book into eight, topically oriented chapters. The book begins with a survey of the global mobile phone infrastructure and differences in the diffusion and adoption of wireless communication in Africa, Asia, Europe, Oceania and the Americas. The authors then turn to the everyday, mundane changes in family and work life, time and new language practices in different national and regional contexts. They conclude by returning to broader questions about societal changes spurred and/or extended by mobile communication, such as the rapid uptake of mobile phones by youth, in the developing world, in social movements and in global development agendas.